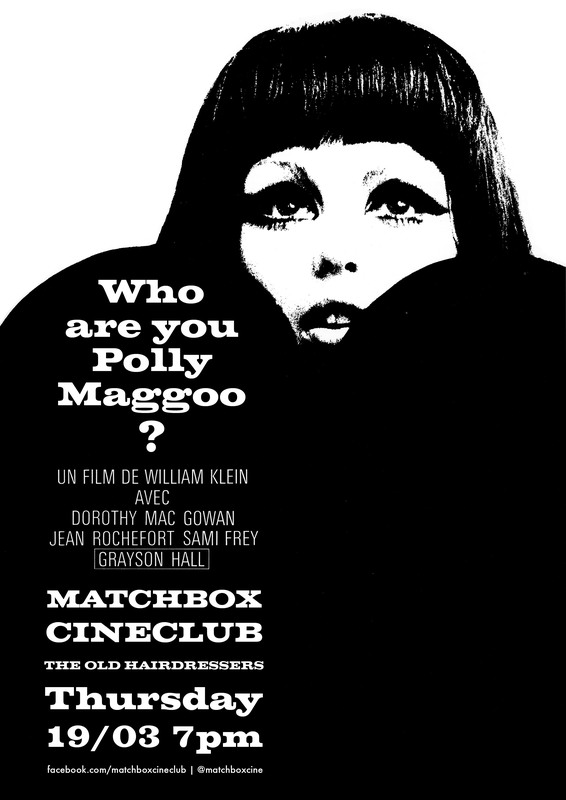 Matchbox Cineclub #3: Who Are You, Polly Maggoo? Our March screening at The Old Hairdressers will be William Klein’s Who Are You, Polly Maggoo? (Qui êtes vous, Polly Maggoo?, 1966). The screening takes place at 7pm on Thursday 19/03, upstairs in the gallery area of the bar. Klein’s rarely-seen film has been described as “a fashion exposé, a raucous attack on media, and a fractured fairy tale,” and is one of Matchbox’s very favourites. Read more about it here, here and here. Our screening is by kind arrangement with Arte. This is the third screening in our monthly series at The Old Hairdressers, which takes place on the third Thursday of every month. Previous screenings there have been The Beaver Trilogy (dir. Trent Harris, 2001; 1979-85) and Stunt Rock (dir. Brian Trenchard-Smith, 1980) in association with Glasgow Film Festival. This entry was posted in Glasgow, Matchbox Cineclub and tagged Cinema, Film, Glasgow, Matchbox Cineclub, Movies, The Old Hairdressers, Who Are You Polly Maggoo?, William Klein. Bookmark the permalink.